One-of-A-Kinds, rare finds, stumble-upons, or just great deals, these adventure-inspiring treasures seek a discriminating home. Sold "as is". Have a question about an item?...click--> HERE. This 9 foot 9-weight, 4-piece fly rod has the power to launch large streamers and the action to handle almost anything that swims. TiCr-X Series Fly Rods feature oversized titanium oxide stripping guides, Titanium-Chromium Coating, Flor Grade cork grip, beautiful rich blue finish, alignment dots and a lightweight aluminum reel seat with double up-locking rings. No rod sock or tube. $279 MSRP. NEVER USED. Only one available. Price includes shipping. TFO 9 foot 8-weight, 4-piece fly rod. Super-fast IM6 graphite designed for TFO by Lefty Kreh. TiCr Series Fly Rods feature oversized titanium oxide stripping guides, Titanium-Chromium Coating, alignment dots, and a lightweight aluminum reel seat with double up-locking rings. No rod sock or tube. EXCELLENT CONDITION. $210 MSRP. Only one available. Price includes shipping. 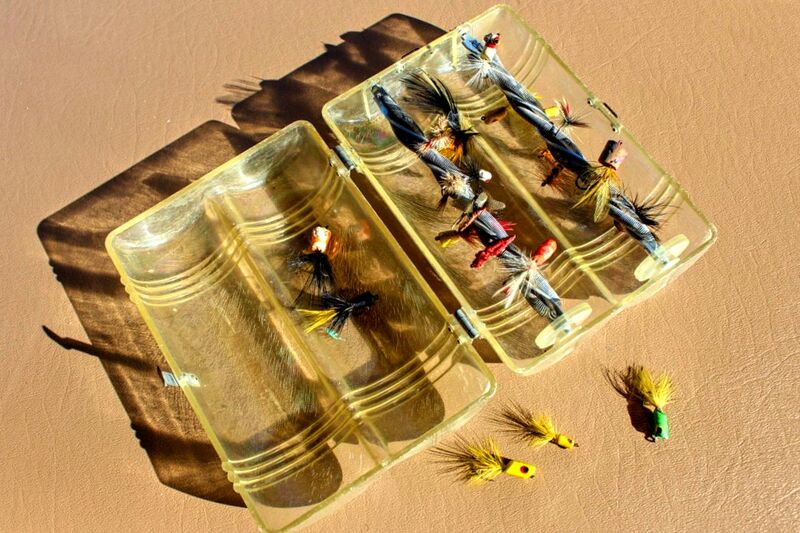 ​What you see is what you get - a rare vintage plastic fly box with hook holding springs mounted to twin revolving wheels, but that’s all we know. We haven’t seen one before or since. It was probably made in the 50's and comes with the flies and poppers shown. Only one available. Price includes shipping. 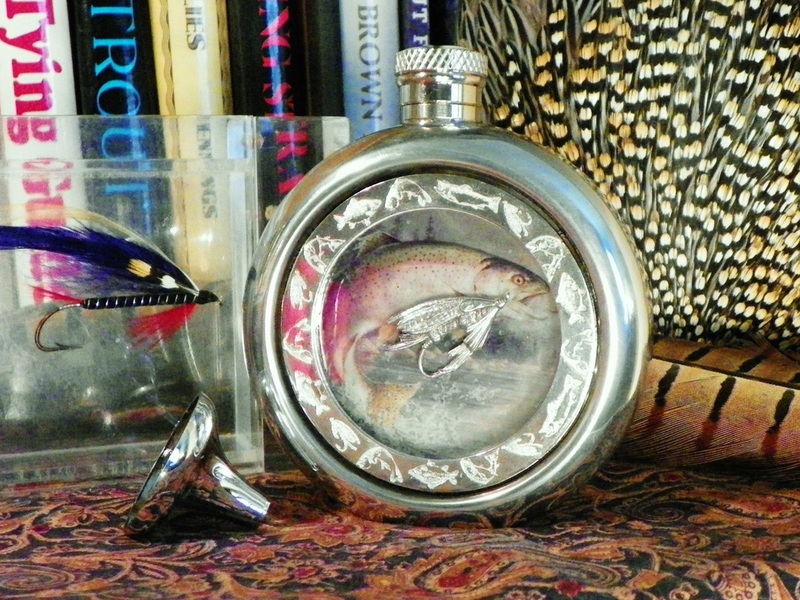 A lead-free pewter flask encapsulated with a color image of a Rainbow Trout and pewter fly. It will hold 6 oz. 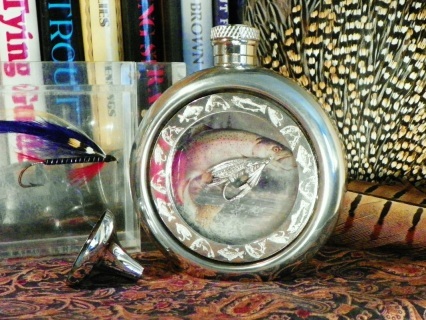 of your favorite stream-side spirits. 4" tall and includes funnel. Some scuffing on back. Imported from England. Only one available. Price includes shipping.